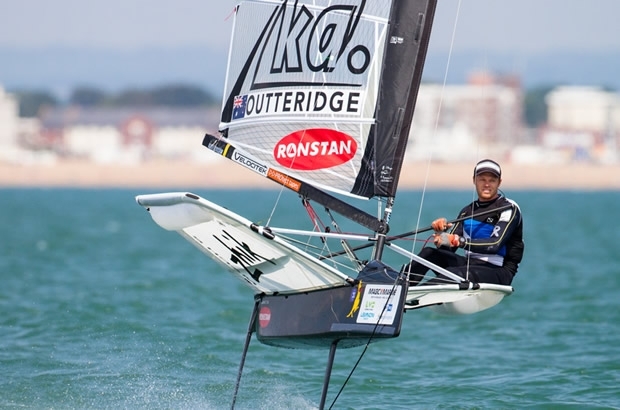 An earlier start allowed the Gold fleet to get a full four races on the penultimate day of the International Moth World Championships at Hayling Island, with the Silver fleet once again getting in three. The breeze was a gusty and shifty 8-13 knots, which dropped off during the final race as it shifted round to the East. Once again racing was held in scorching temperatures under a cloudless sky. Gold fleet started Finals race 3 under the Black Flag on the second attempt after a general recall. Robert Greenhalgh's vang then broke which took him out of the race. Scott Babbage led from start to finish with a good performance, winning comfortably from Nathan Outteridge with Josh Mcknight 3rd and Chris Rashley 4th. The Black Flag remained hoisted for the rest of the starts - the Committee were obviously keen to get the racing in before the wind died. It was clear that with the scores almost even Nathan Outteridge was keeping a keen eye on Chris Rashley with a loose cover going on upwind. Finals race 4 saw Nathan take the win, and the outright lead, with Josh Mcknight just behind and only a second ahead of Scott Babbage, who continued his good form of the day to finish 3rd. Paul Goodison had his best race so far of the finals series in 4th. Josh Mcknight turned the tables on his compatriot Nathan Outteridge in finals race 5 to take his first finals series win, with Chris Rashley hanging on to their charge with a 3rd. The breeze continued to swing East and was dropping all the time in the final race of the day. The big names went for the pin end; Nathan Outteridge was squeezed out but kept his cool to round the top mark in touch with the leaders. Robert Greenhalgh put his troubles from earlier in the day behind him to start well in this group. Mike Lennon was flying in the light stuff downwind and had a 100 metre lead at the gate. Brad Funk, who had a great start to the race, was under pressure from Nathan Outteridge and Chris Rashley. The final leg became really light and fluky and even the leaders were struggling to stay on their foils, but Chris and Nathan managed to weave their way through the holes to finish 1st and 2nd respectively. The Patonator came through strongly to take 3rd with Brad Funk dropping to 9th and Mike Lennon to 11th. Nathan Outteridge summed up his superb day, "We got out a bit earlier today so there was a bit more breeze. I was just able to link the shifts on the first beat. I think I led around the top mark in the first 3 races. I was finding the right end of the line and then judging when to tack. Sometimes you had to overlay the top mark by a long way to get the best pressure and sometimes you had to hitch up underneath, and I was just getting that tack timing pretty good. I figured there were some good oscillations, based on what was happening yesterday. The wind was really good on the left at the top, coming off the land, and we were getting some good righties at the bottom, so in the middle two races it worked out to start at the windward end and I could see that I was just higher than all the boats to leeward of me. I just waited for them to cave, and then just tacked when I thought it was good." On having a lead going into the final day Nathan said, "The forecast doesn't look great for tomorrow, and when the forecast doesn't look good for the final day it's important to be in the lead. It happened to me last year against Bora (Gulari) where he got a couple of points ahead of me going into the final day and we never raced. I'm not saying I'm wishing for no racing tomorrow but at least I'm not going to be disappointed if we don't." Ben Paton said, "I had a bit of a nightmare in either the third race today. I was always quite consistent getting round the windward mark in the top 3 or 4 but this time I had Nathan who came and slammed a tack on me at the windward mark. I lost the wind and ended up getting the rudder caught around the anchor line for the windward mark which cost me a couple of minutes and a 360. I was about 26th at the bottom mark and had to work pretty hard to get back into a counter which I think was 9th. The final race of the day was probably the most tactical downwind race that I've ever done in a Moth; I think we were doing 8 or 10 gybes just to stay in a bit of pressure, lots of places changing so I was happy to get a 3rd in that." Local sailor Mike Lennon, who is currently in 9th overall said about his day, "Sporadic I would say - it was shifty. My last race was shaping up to be a good one; 1st round the top mark, 1st round the leeward mark, 3rd round the 2nd top mark and then 11th into the finish! I just never seemed to find any pressure down the run - I went down the right which paid big time first time down, seemed to sail out of the breeze, boats came round behind, got pressure at the mark and just sailed down inside me and Chris and Nathan just put a quick one in to get into that pressure. I carried on a bit and then put one in and then found a big hole, came off the foils for a while, gybed back again, found a bit of wind, but by that time 10 boats had slipped through. The quality of the fleet seems to have got better since last week, or I've got worse, one of the two!" In the Silver fleet Kiwi sailor Glen Read (NZL 4124) said, "It was good in the morning when we had a bit of breeze, but any mistakes were costly. If you weren't in that front row on the start-line it was game over basically. My first two races were average, but I got a bullet by about 5 minutes in the last race, so not a bad day!" Also in the Silver fleet Dylan DiMarchi (USA 4066) said, "It was good out there today. In the first race there was plenty of wind, half the fleet went left at the start, and half did the port tack approach, and that was fun. I got off to the right side and there was plenty of wind. I rounded in the top five and came up with a top ten finish. The second race was a bit tougher, there ended up being a bit lighter breeze and bigger holes in the course." Katherine Knight (GBR 3604 / WPNSA) is very much enjoying Silver fleet racing, "It was a really good day today. We sailed around on course Charlie (in Bracklesham Bay) and there was actually quite a bit of breeze there, probably around 10-12 knots, so we got 3 good races in, foiling all the time so it was good. It's fun being in Silver fleet as you actually get to fight it out with people. I actually lapped people and had to avoid people so it was a good day for me." Sailing legend Sir Robin Knox-Johnston who took at look at the fleet at Hayling Island Sailing Club said, "I think it's lovely that we've got the championship here. The first time I saw a Moth in action was at Netley as I was pottering around in some small boat. Suddenly this thing was coming towards me and it was all out of the water, and that confused me for a bit, and then I clicked as to what the hell was going on. I thought this is absolutely brilliant! What a great concept and how on earth do you hold it upright like that... What a lovely international fleet too - it's great to see... Why are they here? Because it's such an exciting class to sail. We all know it should be in the Olympics but for some peculiar reason it isn't." When asked when he's going to try foiling Moth sailing, Sir Robin replied, "Well, that's a very good question. When I'm not busy rushing around either organising a race or racing myself. I'm off to do the Round Britain in a couple of weeks, but when I've got the time I'd love to try one!" Racing is set to start at 9.30am for Gold fleet and 10am for the Silver fleet on the final day.